I really don’t know why I continue to read Anthony Trollope’s novels. There can’t be anything more infuriating than his plotting. All of his novels are love stories, and all the love stories are terrrrrrrrrrible and awkward and horrifying in their implications. In this one, Lily Dale is wooed by and then affianced to the dashing man-about-town Adolphus Crosby. Then he dumps her in favor of a countess’ daughter. And Lily just sort of pines away for the rest of the novel. You think she’s going to accept her other suitor, the sort of bumbly and awkward (but rapidly maturing) John Eames, buuuuuuut, she doesn’t. Because she just doesn’t love him. It gives me the shivers to realize that Victorian novelists actually did believe in love. But, given the financial realities of the time, that just seems so crazy to me. I mean, the lady novelists–Austen and Eliot and the Brontes–elide over the problems of love by making sure that the love pairings always have enough money to make things work. But Trollope repeatedly comes to the edge of the abyss by either setting up a very financially comfortable match that is refused for lack of love or by setting up a love-match that can’t work out, financially. And he never really provides a satisfying answer to these situations. For instance, in Framley Parsonage, the Crawleys are deeply in love, but they’re also destroyed by the constant hard work it takes to keep afloat. But, in the Trollope universe, marriages of convenience also have terrible results: without love, the two spouses soon fall upon each other and make each other miserable. It seems like the only thing Trollope’s protagonists are allowed to do is to hope that they’ll fall in love with someone who has money. 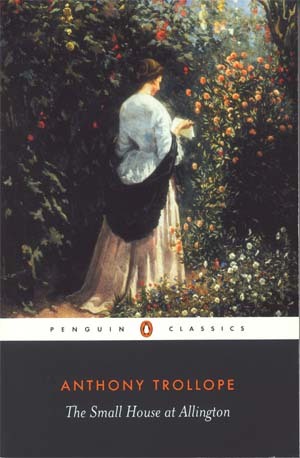 Given how accurately Trollope represents the realities of a gentlewoman’s life–she’s not allowed to work, so she just has to hope that she marries someone with a significant income and no expensive habits–it seems, to me, a bit insane that he comes down so hard in favor of the love-match. But, whatever, the novel still had plenty of fun stuff. In this case, both the male leads were civil servants, so we got to see a little bit about how that world works. And there were some delightful subplots involving the virginal uncles of Lily Dale and their maneuvering and scheming and pride. 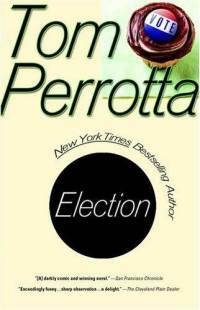 Oh, I also read Tom Perrotta’s novel Election. I really liked the movie Election, and I’d always wanted to read the book. It was super short. I read it in less than an hour and a half. It can’t be more than 40-50,000 words long (my copy of the book was only 200 pages long). And it’s told through so many first-person narrators: I think there are at least five. The most interesting of them is Tracy Flick, the Machiavellian high school junior who’s running for student council president (played by Reese Witherspoon in the movie), but she also gets the least speaking time. Aside from the teacher, who’s fairly interesting and complex, the other characters are a bit insipid. When I got to the end, I kind of wondered, “What was this all about?” In the movie, you’re carried along so fast, that you don’t really think about it, but in the book, you start to feel like it’s just a bunch of plots and events that are thrown together. However, in the end, there’s kind of a deep logic underlying it all. The main character, Mr. M, is questioning his place in the world, and the student council election becomes a proxy for his feelings. Ugh, okay, you know what is nice about having mah own blog? I can just put a little note down here if I want. I got my wisdom teeth extracted more than a week ago, and my teeth still hurt. At least it’s finally getting better. For like five straight days, it only got worse. In the midst of all this, I did go to DarkoverCon though, which was fun. I had dinner with Nalo Hopkinson! And I also met some other awesome people. So yeah, that was super sweet.